‘Calico likes to eat his way out of everything,’ my daughter is giggling her story out to a fellow guinea pig lover. The girls haven’t seen each other for a few months. We haven’t been venturing too far since the cyclone and not necessarily visiting too many people. However it’s about time we caught up with these friends. 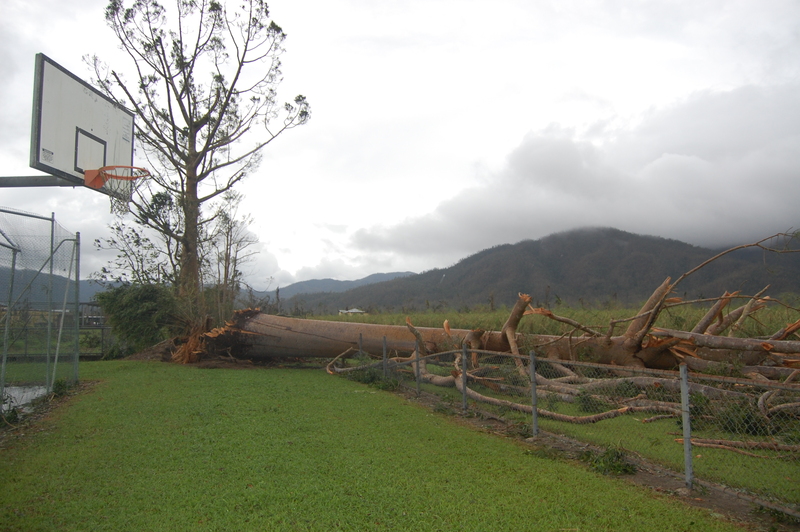 They live up the road just outside of Innisfail, which was in the path of the cyclone and was for a time where the media thought it was definitely going to hit. 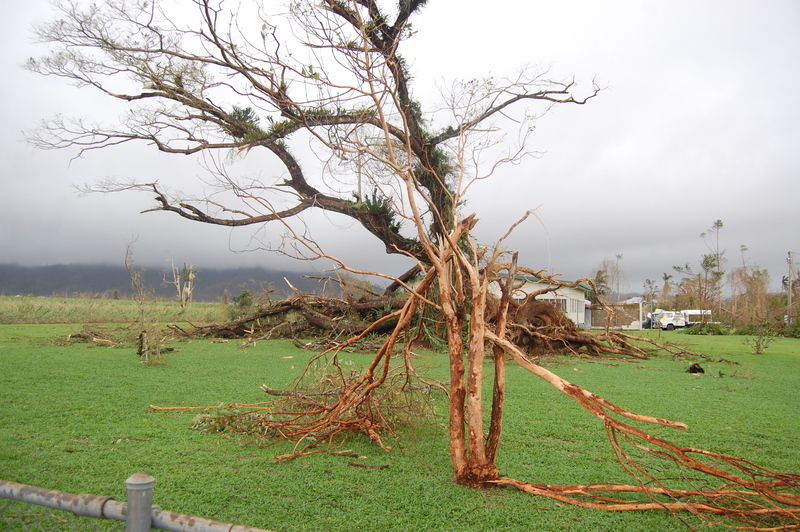 Although Tully, Cardwell and Mission Beach were more severely physically hit that is not to say other areas haven’t felt the impact of the cyclone in other ways. My daughter’s friend’s Mum and I are discussing what we did with the guinea pigs during the cyclone. They used cardboard boxes and a washing basket to bring them inside. We bought ours inside as well. Ours had straw lined orange plastic crates that were very cheap. They were very comfy. I still can’t believe they slept through the cyclone, even with the tree falling on the house. They only needed an occasional pat when they became just slightly distressed about the whole thing. Their little squeaks were barely a whimper. Prior to the cyclone we’d been a bit worried about them as someone told us her guinea pigs all died of heart attacks during cyclone Larry. The kids knew this and were very watchful of their little ones. A few weeks before the cyclone was apparent, and made its journey to us, the kids had bought two guinea pigs. They began with Chocolate and Misty, and the new ones to join the brood were Calico and Soot. It took a while to introduce them to each other. When a new set of guinea pigs meet they must have time to adjust to each other. My eldest explained the psychology of it to me in great detail, as he tends to google all things guinea pig. They were not getting along yet, but had been getting used to being near each other with pens alongside each other. The first few meetings a pecking order was being established. Calico definitely wanted to be boss, but none of the others were having it – especially Misty, who can be rather stand offish, and was not giving over any power. Sometimes however they were delighted with each other, and purred even. But then a plane of something would fly over the garden and they’d all be fighting each other. ‘Guinea pig wars can be slowed down by a towel being thrown over them,’ our googling guinea pig expert told us, demonstrating by dampening the fight with one of our towels. The days went on in the lead up to the cyclone with quite slow progress to friendship occurring. Each day the guinea pigs spent some time with each other. The kids bought them inside for separate cuddle time still though as they were a bit weary of breaking up fights. Then along came Yasi. It was very stressful leaving our pet guinea pigs behind in the eye of the storm. I just had too much to carry with scared kids, cyclone kits, and the worry about how long we really had to take it all to the car and get going. My eldest son and his Dad were off clearing a path for the car to make it out of the drive way and I couldn’t see them in the dark. I called out to them- and as I did so dropped some parts of the cyclone kit. I couldn’t grab four guinea pigs, and two birds to add to the refugees from the home. Although we lost Peep, we have gained some new friends, like this tree frog. So we left them. I thought of them all night, prayed that they were safe in the bathroom were we had nearly stayed. I really hoped that they were well. It was such a relief when we saw them and of course Peep – still alive at that stage and Buddy our little quail was also fine. After Yasi the guinea pigs were rescued from our NG marked home and placed in a cage in the garden of another friend’s house. They had to be together, we didn’t have the luxury of a spare cage as their other one was a bit cyclone damaged. We were watchful and put a couple of them inside a washing basked inside the other cage. We found next morning they had Houdini like made their way out. They were all getting along famously. Not convinced we put two back under the wash basket. Again they escaped, and still showed they were great mates now. They all snuggled together, and were not going to be separated by anyone -a new home brought a new attitude. Of course when we had to move them again to their actual new home, our new home, around twelve days later we were a little concerned things might go backwards. They didn’t like leaving their comfy surroundings much for the first few days, but it didn’t take long and they loved the new home. We were happy they did not suddenly drop dead like Peep. Concerned for Buddy we went and tracked down a female quail at the pet store, and paid for her and bought her home. Buddy has never been happier and they now have quail eggs, although they aren’t particularly good parents to them. They now have a deluxe apartment no less on our balcony for wet weather, and a couple of out door hutches whenever it is dry and sunny for them. They kids have purchased them a pet bed which they can’t wait to try out. My eldest son thinks first of his pets whenever we go out. ‘They need something soft’ and what about their food and today he said ‘Now Mum don’t forget their vegetables and check their water.’ Which I do everyday when they are away without being told, but I am sure he just feels that little bit extra protective of his surviving pets. There have also been bath days. It’s always a lot of fun to watch as all of them love the water, which is not true for all guinea pigs. They are then wrapped in towels. I have special old towels for guinea pigs now and they are kept in a cane basket for the kids to access. They love snuggling their guinea pigs and watching them sleep, which is one of their favourite occupations after eating, and purring. Although there are occasions on which they indicate they are watching television. Now the other amazing story of Yasi, apart of the survival of guinea pigs who have hearts of steel, has to be the survival of chook houses. You would have thought with all of the torn up sheds that a chook house would have ended up somewhere on the other side of the Pacific Ocean, but no they made it!! We went to check on some friends after the cyclone. We drove to lots of people’s houses as we couldn’t ring them as the power was out and that was when we were proudly shown the surviving chook houses. Some people had taken their chooks indoors and others hadn’t but all of our friends’ chooks had made it through. Last cyclone I saw lots of butterflies afterwards. This time I don’t see so many –but our new garden has lots of dragon flies. They have the most delicate wings, and yet they make their flight so easily. Other friends have seen butterflies though, and one tells me they surrounded her. It was simply amazing for her as they settled on her shoulders and in her hair. I love picturing her as a butterfly woman being healed by the butterflies who say, ‘Don’t worry about silly old Yasi.’ I don’t hear this story until a month after the cyclone. Again we haven’t seen each other mainly because we are so busy moving stuff in a Ute from our sodden house to the new one, and she also is busy sorting out insurance and those practical things that happen after cyclones. She tells me about how she had hoped to have my family out to the farm to go on the walking trails and river to see the land and the crocodiles where her family live. Her husband had made all these trails but Yasi has knocked the trees and debris over them. It will take a long time to build them again. (c) June Perkins, All rights reserved words and images. First posted 21/3/2011. All our guinea pigs have now passed on. They survived a cyclone, lived happy lives, but one by one they all passed on. Dear little things. This is not included in the After Yasi ebook, but is part of the blogged story of our recovery and resilience journey. I may collate all these blogs into a book at some point. A longer account than could be included in the After Yasi book. Beating down sun. 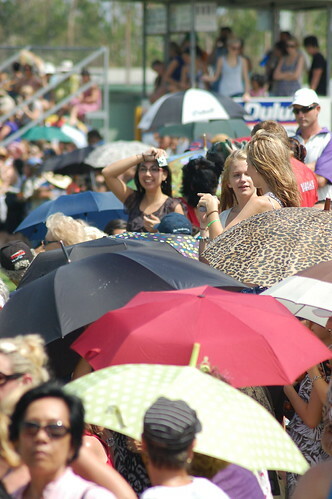 Umbrellas of all colours and sizes. People of Tully gathering, Young and old, families, babies, all backgrounds, a throng of people waiting for the Prince to arrive. They find their spots, on the boundary, in the stands, and some like me wandering to find the best camera vantage points. The first royal visit to Tully, a second to Queensland. People chatter with the SES and police. Red cross staff walk around – maybe they are part of the select 50 guests in the igloo. Water and ice everywhere in big buckets so people don’t dehydrate. People waiting for the arrival. Orange lines marks the middle of the oval. He will be touching down at some point. A small emergency helicopter comes. He will be coming in an army helicopter. Elderly ladies with young spirits joke they’d like a kiss from the Prince. Story on website only not in the After Yasi book. Yasi took some things from us that we will never have back again. It took away our beloved Peep. Peep was a mynah bird, considered a pest up here, and as a chick it fell out of a tree. It should have been eradicated, but ‘we took it out of the gene pool’ and it became our family pet. Peep was hand reared by the kids and me (when they were at school), and became very tame. It liked to sit on people’s shoulders, especially my eldest son’s. Sometimes it even tried to play the guitar, and it had just worked out how to bite and pull the strings to produce an effective note. Peep loved to peck your fingers when you typed at the computer. It was a pain. I had to use bionicle claw to shoo it away as nothing else worked. Peep loved to sit on your head, especially eldest’s bushy red hair. We think it may have been a girl because it kept nesting a lot the last few months. We gave it twigs and things for its cage to play with. Not that Peep spent much time in a cage. As soon as Eldest was home that bird was royalty. It went for walks on people’s shoulders around the oval, and David and our eldest son, taught it to hunt for bugs. Peep liked to mimic the telephone and other birds, like lorikeets. We think he had a wagtail and another mynah bird that visited him at his cage and spoke with him. Peep liked to play with string like a kitten. It liked bright things! It liked to try and iron creases in clothing with its beak, and loved my bright skirts. It thought it was the centre of its universe, but welcomed us into that universe. Sometimes I think Peep thought it was human. Before the cyclone like most animals and people Peep was on edge. It kept diving into every available water container I had filled that didn’t have a lid. I went to take him outside, just to calm him down, silly me, and he flew away with a passing flock of birds- it happened so quickly and he was gone over the cane fields. Oh no! I thought he was lost forever and eldest would never forgive me. I went out calling for him Peep, PEEEEP and darned bird it made me cry. My youngest said, ‘Come in Mummy don’t go too far please.’ I kept calling Peep, peeeep and finally had to give up as the winds picked up and youngest got frantic. My eldest kept calling too, and whistling, he loved to whistle for Peep, and then miracle of miracles, Peep the prodigal bird returned two hours later, without so much as an explanation and with two other Mynah birds in tow who took off when they saw humans. Peep was back. During the cyclone Peep was doing okay. It had food, us and of course the guinea pigs it liked to preen every now and then, and it hopped from shoulder to shoulder but it did get more frantic. We had to put it in its own room as we did not have a spare portable cage. After all Peep had little use for cages except his large bird penthouse at bedtime. And it was really crazy when the tree came through the roof with a loud THUD. We took Peep with us to the bathroom which we had decided to flee, but left him and quail and the guinea pigs there. It was so hard for the kids to say goodbye to them but impossible for us to carry all the animals and the cyclone gear and kids. So off we went into the night leaving them there. Our guinea pigs (another story) slept through much of the cyclone. They were calmer than Peep. They only needed the occasional pat, although we were worried for them. All through the night I wondered how they fared. The next day we went back to the house. They seemed okay. We kept them there, and came back to feed them until we had found somewhere to move them. Peep seemed okay. We visited each day and fed all the pets. It was only a day to the new home, and then sadly a phone call from my friend were Peep was staying, Peep had died. We do not know exactly what killed him, perhaps it was shock from the cyclone. I went off somewhere private and cried. My eldest was angry for a few hours at the whole situation that had happened for his bird. We went down to the Cassowary Coastal Recovery centre and I cried on the way in there. In the end some Lifeline people came and sat with us and we could speak a little about the loss of the bird. Then we went to pick up Peep’s body. It was a brilliantly sunny day. We took him to bury him at our old house. We dug a hole and took the box he was in and put it under a tree. David asked that Peep’s spirit protect the trees from future cyclones, and we said some Baha’i prayers. The wagtail, that might have been his friend, looked on. What was left of the trees was not much but the lorikeets went looking through them for food. Some of the staff from the school saw us and came over to bring us some chocolate cake. They saw we were in the middle of serious proceedings and waited. Goodbye little Peep, to fly for evermore through the forest, no longer considered a pest, but our little hero bird. Why is Peep a hero? Because it bought such joy to our family, tried to save two other mynah birds, survived the cyclone, and because it was Peep! We joined the red ng club. NG means no go. Your property is not safe for others to tarp or help remove stuff from. However, we are getting everything out that we can. The red ng has meant we can’t get any help from organisations and must do the best we can. It is a race against time as the ceilings in two rooms are gonna go! We have most of the important stuff out, photo albums, Baha’i books and diaries. The school Principal has been brilliant, ringing David to see how he was yesterday, and David has had the teacher union, counsellors, and others listen to him. She made sure a house was found for us and has been concerned for the well being of David and his family. Some people really rise to the occassion. We are both very impressed. Some people, not organisational, have come and helped us remove things from the house and bought their utes, an awful lot we have do with car boot load, after car boot load. We are on load five of boot loads today. I conked out at load 3 and David and our eldest son continue. The highlight of today was David telling me the eagles are back nesting in the remaining Kauri pine. This really lifted my spirits. It is giving its own definition of ng, not going- but staying. On you eagles! We’ve spent a few nights in our new home. It is beginning to feel like home, because home truly is where your family is and you don’t need anything else to make it home. I would be happy if the roof fell into tomorrow at our old house, just knowing we have our family around us and our friends. It is good to know they are all safe. I will be doing the hero roll call for our family soon. But just one precious act was someone leaving fresh towels and sheets in case ours were damp on our door step at the new house. We wouldn’t have been able to find any with so much soggy and water damaged, plus we were tired. What angels!!! I don’t know who you are but this was so special for our family to have new dry sheets to call our own. There is so much to say and reflect upon- the numbness of the last few days has well and truly lifted. I go everywhere with my camera looking at the old, and the becoming, and the renewal. It already begins!!! Today we listened on the radio to the kids and teachers at Cardwell school. ABC radio are doing a fabulous job. They are out at Mission beach tomorrow morning. Wonder if we will hear people we know on air, probably we will. I will come back to the ten days of homelessness in another post, well I should say that is without our own home, but we were in three families homes, the longest being our stay at the Baker’s home. Thankfully we knew kind people who offered to take us in. Please note this does not appear in the After Yasi book but in cyberspace. What’s it like to go through a category 5 cyclone? I never thought I would know the answer to this question and that I would, along with my family and many other cassowary coasters, experience the strength of the wind in houses that shook as if they were Dorothy’s in the Wizard of Oz. Two fat kookaburras sat on our clothesline in the light hours before the rain began to pick up and wind started to move the palms into a flag of wind directions. We heard the kookaburras’ ironic laughter a few more times in the afternoon. Waiting – we seemed to wait for hours and hours. We just wanted it to be over. But we did not know how violent that storm was going to become. We couldn’t see what it was doing in the dark, but boy could we hear it! Before the cyclone, everyone was bunkering down, and saying on Facebook- ‘See you on the other side of YASI’ I don’t think they knew just how challenging it was going to become. Some of us rang close friends to wish them luck. I rang three of my friends, one a mother to my daughter’s best friend and a couple of writer friends. It built slowly; then picked up momentum. We felt like a giant hand shook our house, harder, and harder. It was just like contractions that strengthen as the birth of the eye of the storm nears – only the mother of this storm was feral wind gusts that could lift rooves, peel tin off roofs and sheds – it was as if one tremendous tin opener descended from the sky and went on a rampage through our homes. We felt like we were in a jumbo jet at times and our house was going to fly away. We could hear things banging, blowing and crashing into things. We heard the sound of the wind gremlins under the house, shifting and knocking things so that it felt like the cyclone hit us from the floor as well as above and sideways. We knew there were big trees all around us. A mango tree fell through our roof and splintered the ceiling which shot down in shards to the floor where we were sheltering. The bang was startling, and our dear bird Peep, was flying everywhere. We grabbed our guinea pigs, quail and Peep in each room change. It was a menagerie, nothing like Sal Badcock’s (a friend who cares for wildlife) ark of animals, but ours nevertheless. My dear husband, approached the cyclone scientifically, getting updates from his family on phone, who were consulting the BOM site and he then used the data to calculate which room we should be in. We had no electricity, iPhones or that sort of stuff. He was calculating the direction of the wind and moving us in rooms accordingly. He asked for updates on the cricket – to calm himself and our youngest, who loves cricket. Our bathroom was not the best room for some of Yasi and then it was, according to his calculations. I was irritable, anxious, and felt the storm in every fibre of my being. I wanted to be somewhere else, but felt so protective of the kids. I squeezed my husband’s hand and hugged my kids. Why us, why now, why this storm? Later hubby was to tell me his family were so frightened for us they needed comfort in the cyclone we were going through. Comfort for potential loss of us and no way of being able to help us, was driving them crazy. We were at the mercy of nature. Yet I have been more scared, once when someone tried to break into our home and they knocked and banged on the doors and windows – a cyclone of human drunkenness or worse, intent on getting inside and hurling abuse at us. People are still scarier to me than cyclones. Our front doors open and we felt a funnel of wind blow the back window open. Hubby and eldest son kept going to close it. A window smashed in our bedroom but we weren’t in there, but we could hear it shatter. My eldest thought of getting a board and nailing it across the front door. So he and his Dad did that in between the gusts. Going to the toilet was a real adventure. It was spooky in there and filled with the loudest and worst sounds of the storm. Nowhere felt safe as the cyclone built and then consolidated its strength. We prayed, checked our cyclone kit, and comforted our pets – Misty, Chocolate, Calico and Soot and our youngest son who was terrified. He snuggled in his blanket, and hid under a desk. His sister had a nervous smile on her face. The science of the cyclone interested her too, ‘this is scary but brilliant,’ Oh dear, I hope she doesn’t grow up to be a storm chaser. ‘Don’t smile’ yelled her terrified brother. We recorded our experience in photographs and sound-bytes, ‘perhaps if we don’t survive our story will’- we thought. And then we ran in the eye of the storm, to the car, leaving behind our beloved pets barricaded in the bathroom. This was hard. I had to explain to the kids there was no time to grab the pets, and that the pets might make this sacrifice for the kids, and die in their place. I did not want to run, the advice says stay put, stay in the bathroom, but there was a tree near our bathroom, tall and strong, ready to fall, and hubby felt let’s go, both on calculations and gut instincts (this is a man who loves to wear odd socks to keep his students alert) ‘we’ll be safer up the street’ – no time to argue, a decision had to be made. I went with the scientist and we ran to the car. It was dark and flooded in our laundry on the way to the car. Trust at times like these can be tested; disunity has the potential to destroy as much as the cyclone itself. We waded through it, kids, cyclone kit, and five guitars (at our eldest son’s insistence) in tow. Hubby moved the debris from in front of the car for us to drive out. Thank God the car was alright to drive. We went through power lines, thank God the power was switched off – it had gone out at 4pm. We arrived at the house of some neighbours; they sheltered us in their laundry and gave us soft drinks and a mattress. The kids dropped off to sleep. All squashed up! It felt so much safer in this low to ground stone brick home. I didn’t sleep. I kept waiting for it to end. 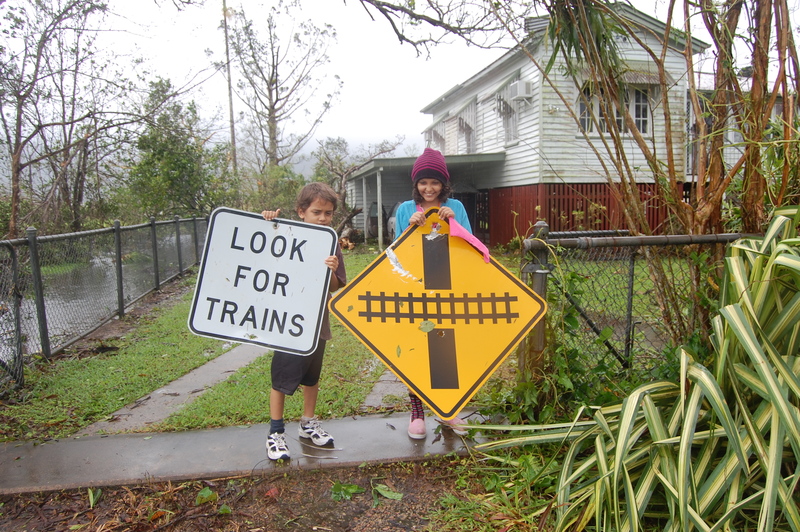 My children did as they sensed greater safety. Such precious sleep through the rest of the storm they had- and they were going to need that extra sleep for days of homelessness and uncertainty were about to follow. At one point in the second half of the storm my youngest felt like ice; I checked his pulse to see if he was breathing and was frightened for a moment he had died of shock, but then the gentle rise of his chest told me otherwise. Some friends were later to say the second half was worse for them. Some people had no eye at all. Oh for that brief chaotic break that allowed us some freedom. Some had an even greater menagerie of animals; some people had backpacker’s evacuees from lower lying areas with them. Some went to stay with family. Someone’s grandfather was out cleaning the garden before the cyclone. We woke next day at our neighbour’s house and waited for the wind gusts to die down – the gardens looked like someone had just hurled everything randomly around in a violent fit of temper. We thought of our pets – time to go see them soon and check how they had fared in the bathroom the other place we would have stayed. Would you like to subscribe to the quarterly Pearlz Dreaming newsletter?